Hello. This time I’m gonna write about another antique thing that I had found in the basement when I was moving elsewhere to live. 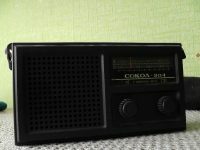 That was ~3 years ago and the thing is an very old Russian radio “Sokol-304”. The radio itself is ~25 years old probably (older then me :O) and the best part is – it works just as great. Of course, the contacts were rusty so I had to replace them but all you need for it to work is batteries.